Loft continues to be a top request of y’all’s, and I really can’t blame you! 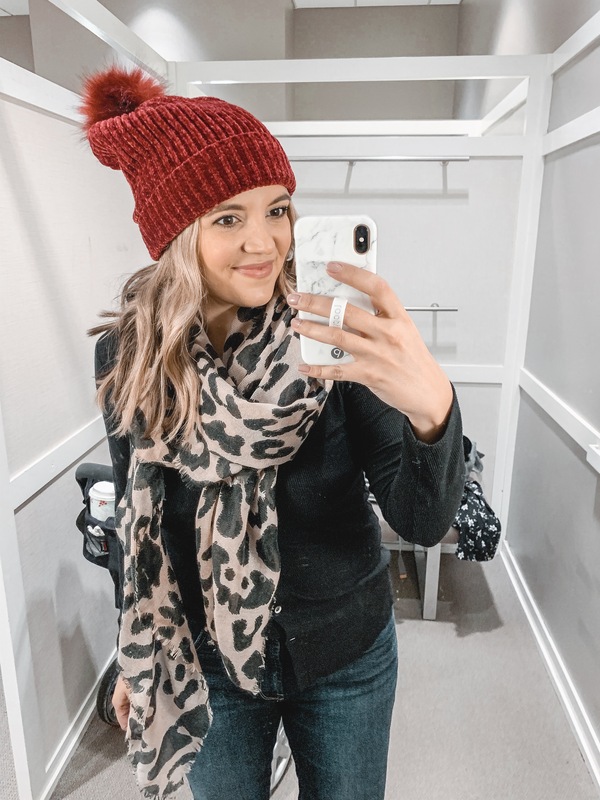 I have made more purchases at Loft in the past few months than almost every other retailer! 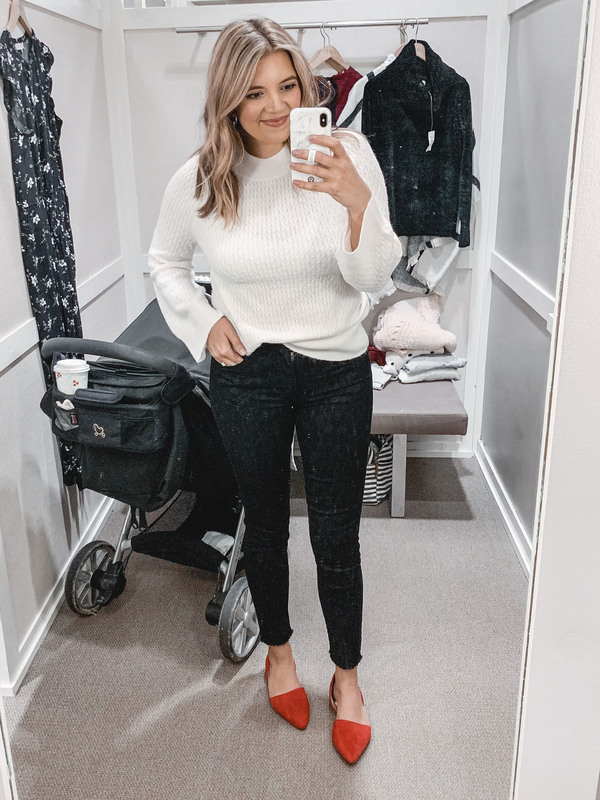 They have some of the cutest modern basics, which I can’t get enough of! And their sales are really some of the best too. If you have any question about sizing, be sure to check below each photo! I’m listing the size I’m trying as well as any sizing recommendations I have! 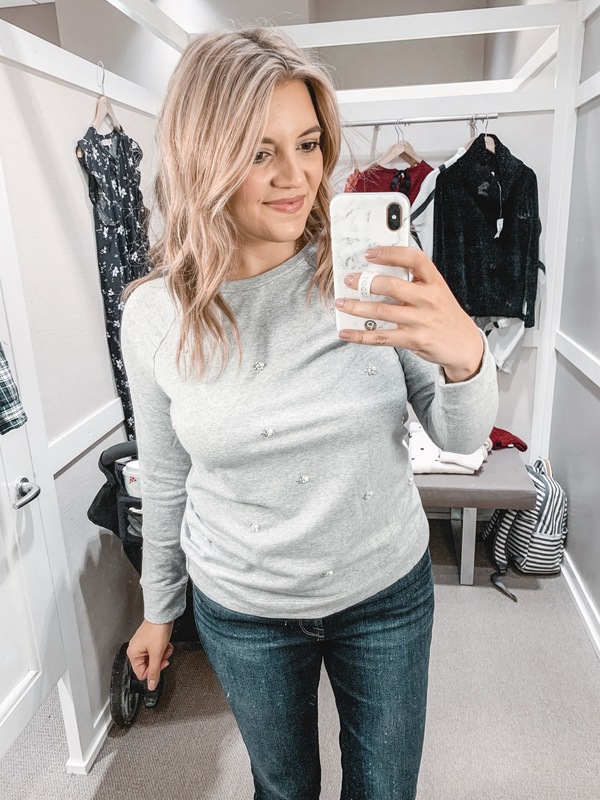 I am 5’7.5″ and currently a size 29/8 or a medium! I love a fancy sweatshirt and the peplum plaid just got me. Fit is a little oversized, so I would recommend sizing down. My only one complaint is that the peplum doesn’t lay as flat as I would like! It sticks out a bit, but is still so fun for winter and the holidays! I love this green plaid pattern. It’s one that can work for the holidays, but it won’t be pigeonholed as just as a holiday top! It also can wear a little more dressy! It’s collar-less and has a ruffle at the button line! Fit is pretty oversized. I’m in a medium and would have preferred a small. This sweater is right up my alley. Stripes and a fun texture?! YES, PLEASE. Fit is a little oversized. I’m in a small but I could have also gone with a medium for a more relaxed fit. Just a quick note: a few of the “stripes” are in an open-knit design, but I wouldn’t feel the need to wear anything underneath! 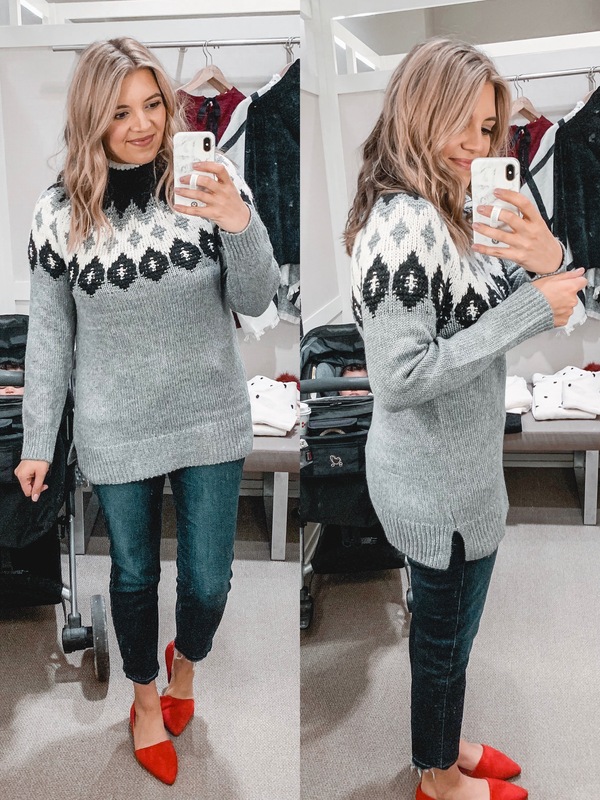 I’ve talked about my love for a classic fair isle sweater, and this one is a good one! It’s a nice heavyweight option, and I really like the long tunic length! 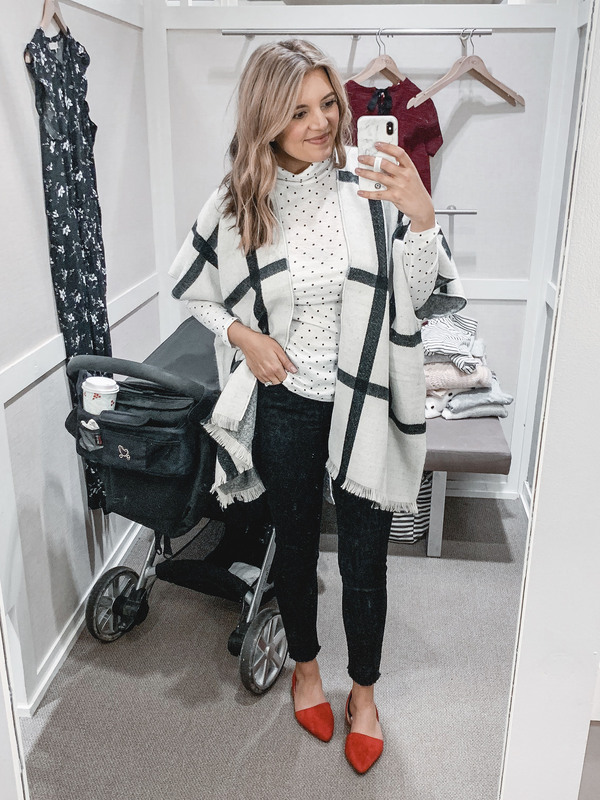 You could easily wear this with leggings, but it also works with jeans! My taller ladies may want to size up for additional length! Although this one is a sweatshirt is definitely comes off as more of a heavier weight tee! It’s a thinner sweatshirt and the embellishments are beautifully understated. 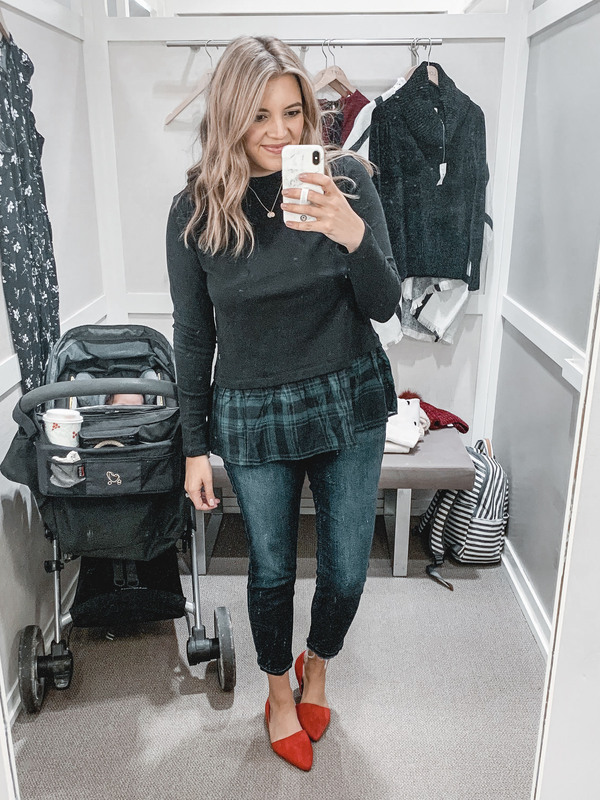 You could wear this with jeans like I did here or layer it up like a sweater! It’d be adorable with a plaid top underneath! The quality of this sweater is SO GOOD. It’s a thicker weight and the polka dots are actually embroidered bobbles. The neckline is a boat neck, which is very feminine and flattering! I’m in a medium! 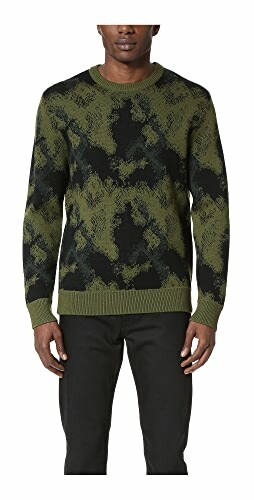 I really loved the look of this sweater! It’s the very faintest blush pink and has a large knit. I also loved the open knit at the arms and top. The only downside is that it had the very slightest itch factor. If you’re not sensitive, I wouldn’t hesitate! I didn’t find it uncomfortable! 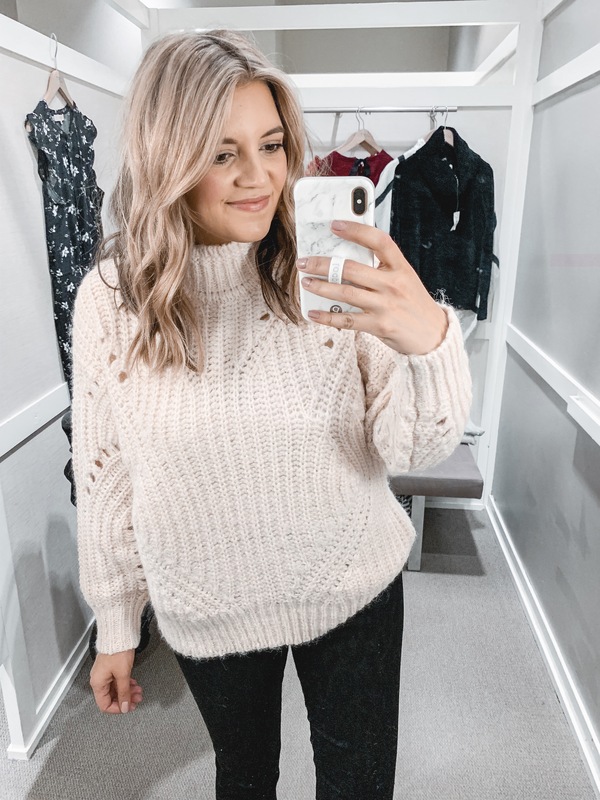 This sweater was one of my favorites I tried. It was a no-brainer purchase! (And I’ve already worn it!) I love the mock neck, the texture, and the slight bell sleeve! It comes in several colors, but of course I love the ivory! Fit is relaxed. I’m in a medium. Now let’s chat these jeans. Y’all: they are leopard print!! I love how the print is super-subtle. It makes them much more wearable. 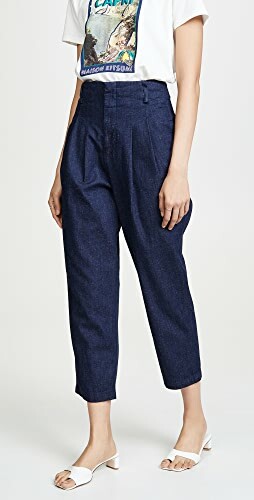 These are the type of jeans you can dress up for a night out or special events. Fit is definitely smaller than most Loft items. Stick with your true size or one size up from your typical Loft size. 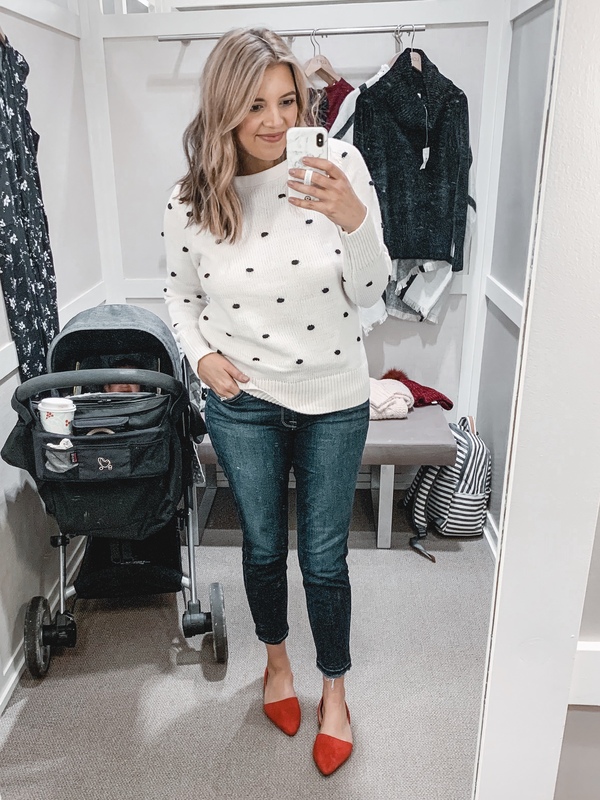 If you’re looking for a sweater you can dress up, I love this one! It is so dainty and ladylike! The details look like lace, but it’s all knit! 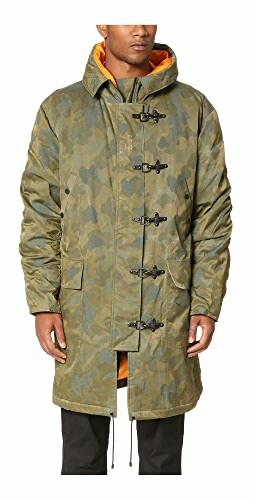 It comes in three other colors and is just beautiful. 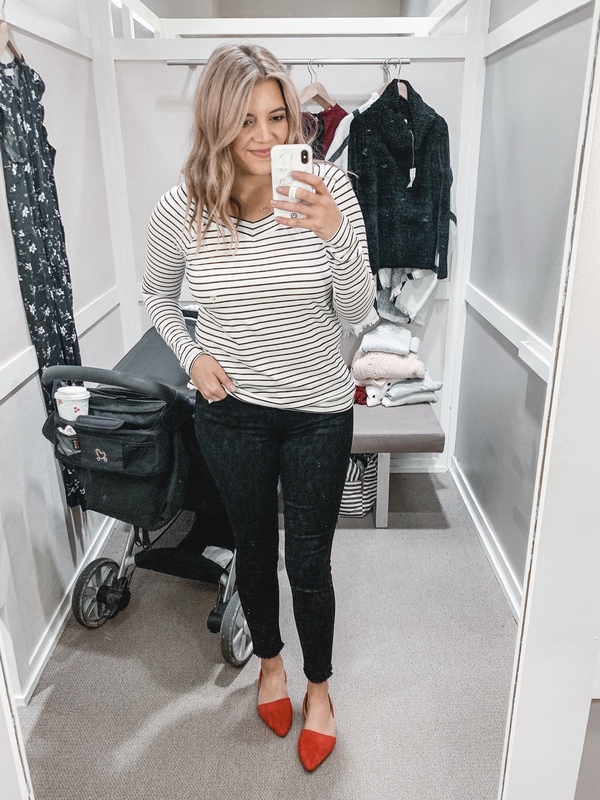 Y’all know how I feel about a stripe tee, right?! Just give me all of ’em. 😂I love the wide v-neck on this one. It’s so flattering! Fit is tighter in the sleeve and relaxed mid-body! I’m in a medium. It also comes in solids! 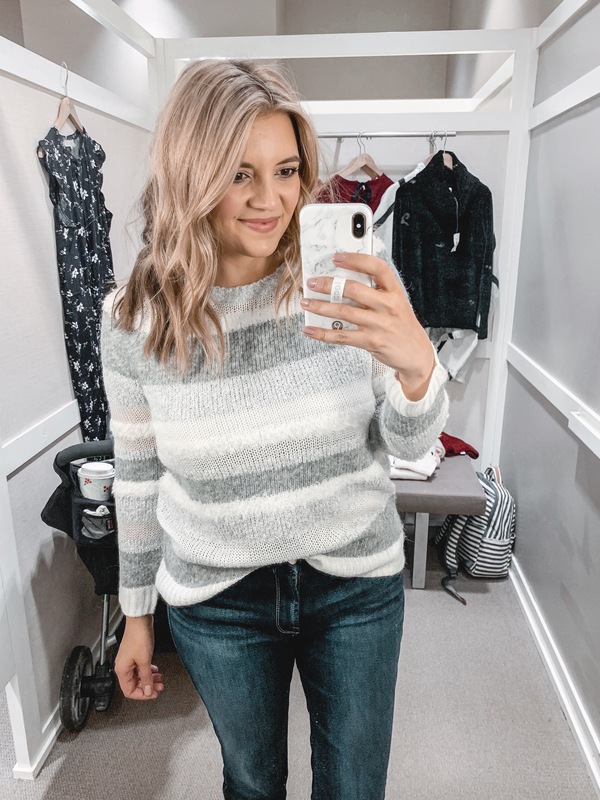 This sweater was another instant yes for me. I am such a big fan of chenille. There is nothing softer! I love the classic black, but the texture makes it more modern! It also comes in mint. My store only had a small, but I liked the fit! 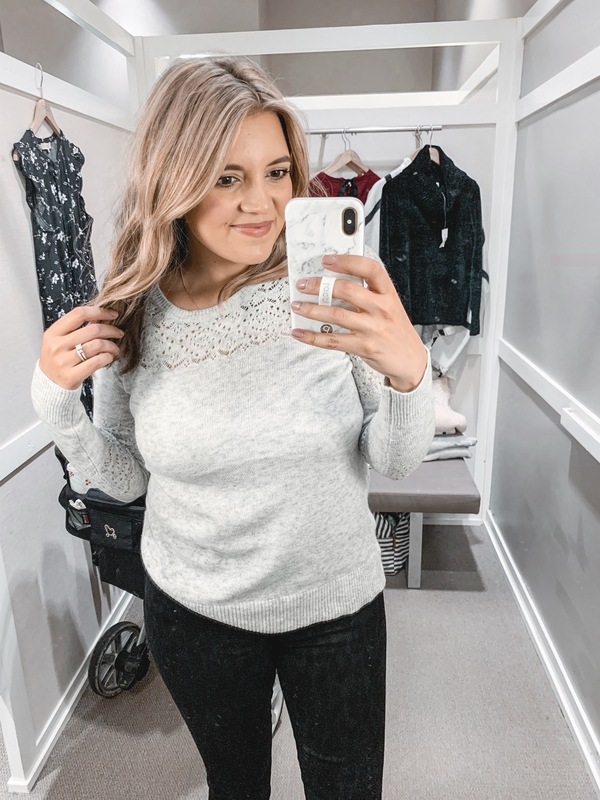 You could also stay with your true size for a more relaxed fit! 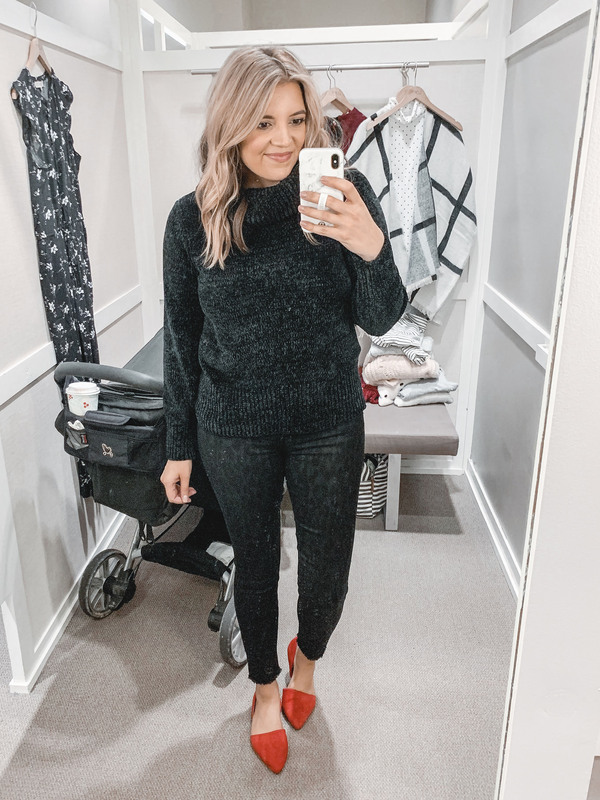 I’ve been trying all the lightweight turtlenecks lately, and this one is a good one! 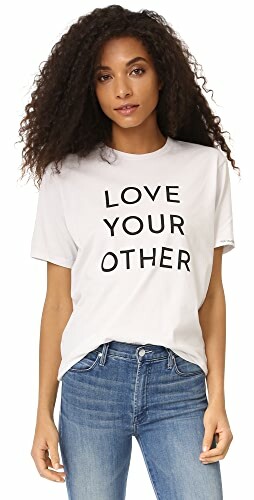 The white is textured and slightly sheer like a Madewell whisper tee. The polka dot is such a fun detail too. 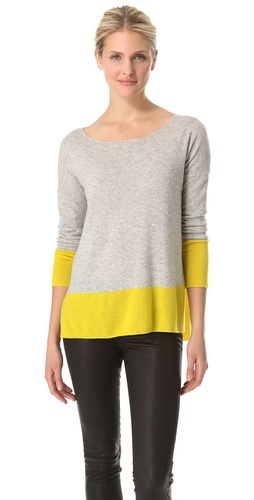 This is a great layering piece! 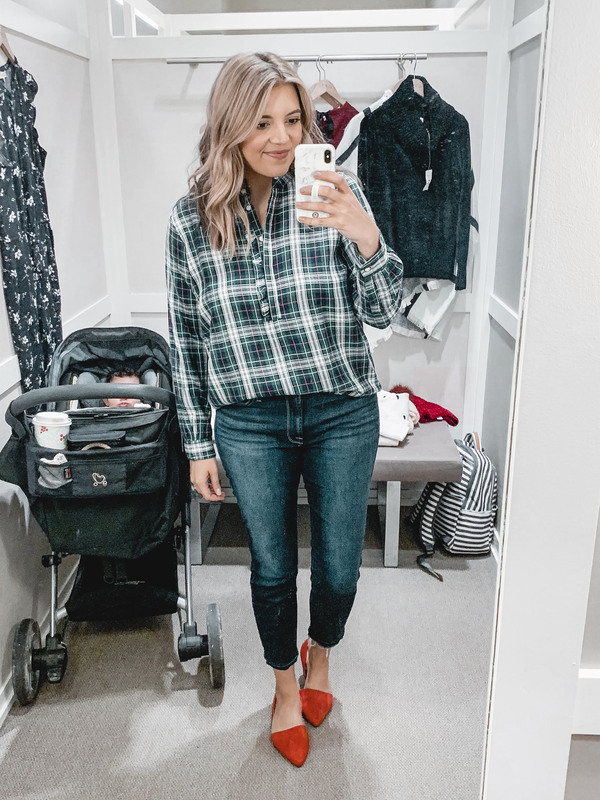 If you don’t have a plaid wrap in your wardrobe, they’re a great layering addition! Wear them with tees, turtlenecks, sweaters, dresses– so many items! 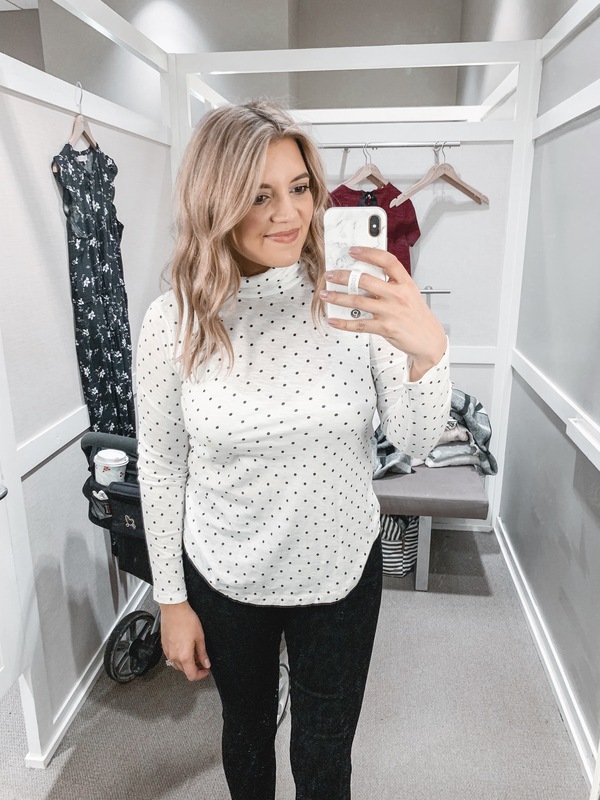 I love the subtle print mix with the polka dot turtleneck! Another item I took home with me! 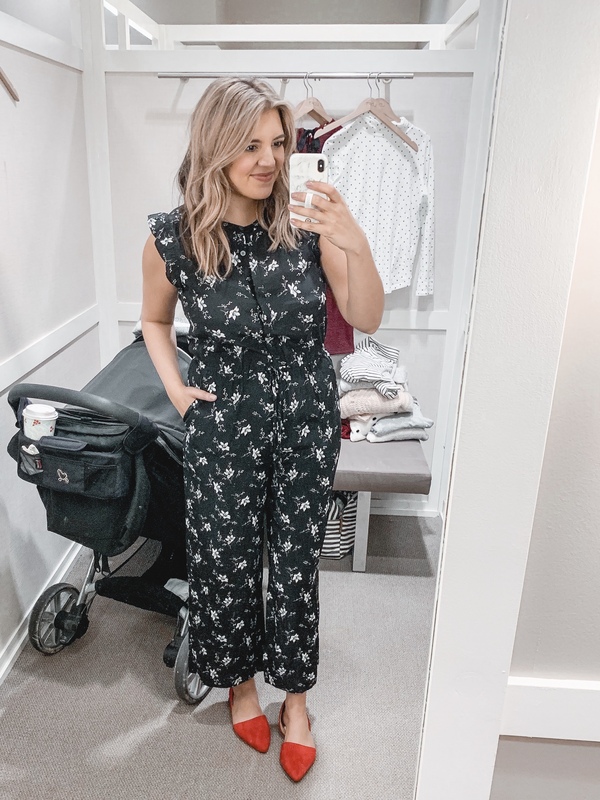 This jumpsuit is nursing-friendly with the button-front top! The waistline is drawstring, and I love the wide leg. You can wear this with flats, heels, or even booties! It also comes in a solid black option! Fit is TTS. This is a great work dress that you can also wear for special events! Of course I loved the bow back detail! Fit is relaxed. I’m in an 8. Size down if you’d like a closer-to-the-body fit. 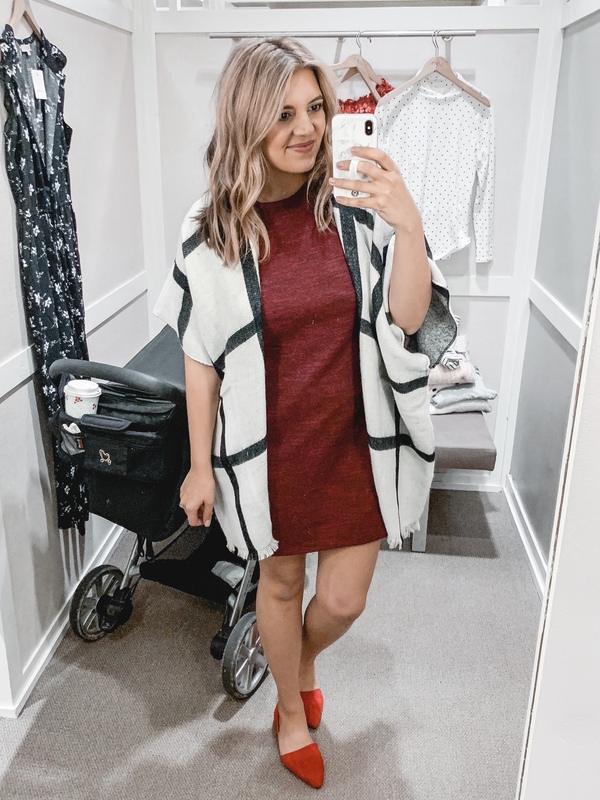 Adding the wrap to the dress is a great way to make it more casual! 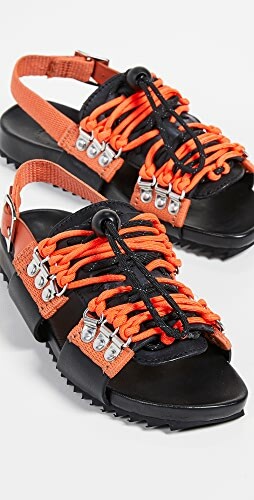 I’d pair it with booties or over the knee boots! I love this winter floral. The bright red makes it an unexpected choice for the holidays straight through Valentine’s Day! It’s also super-flattering with the fit and flare cut! Fit is TTS. I’m in an 8. Unfortunately, this one is not nursing-friendly. This hat was a last-minute grab, and I love it!! The color is somewhere between burgundy and red, I love the texture of the chenille mixed with the big faux fur pom! 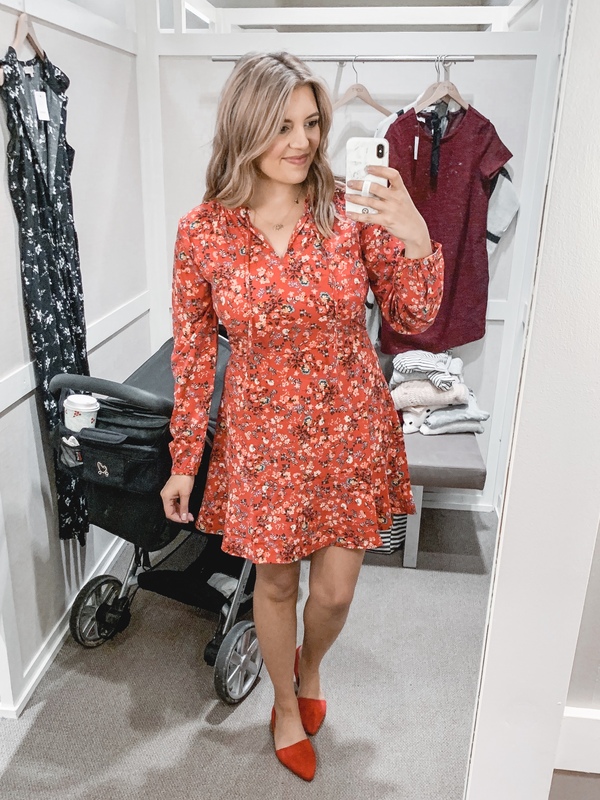 See my October Loft try-on session here! Or all try-on sessions here! Shop Black Pumps Heels, Metallic Shoes, Off Shoulder Jumpsuits, Gold Flats and more. Get this widget.